In 2015, the annuals Impatiens Bounce and Big Bounce are making a colorful splash. 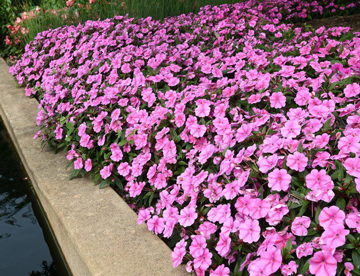 This variety is resistant to the downy mildew that decimated impatiens three years ago. Find Bounce in five colors, and Big Bounce in six colors, including Pink Flame and popular White. For a different take on the geranium, try the Geranium Glitterati Ice Queen. This striking variety is as noted for its foliage as for its orange flowers– the white and green leaves provide high contrast and visual interest. Learn about more great annuals for 2015 in this article by George Weigel.